DRACUNCULIASIS (GUINEA WORM DISEASE) IS A PARASITIC disease that is limited to remote, rural villages in 13 sub-Saharan African countries that do not have access to safe drinking water. It is one the next diseases targeted for eradication by the World Health Organization. Guinea worm disease is transmitted by drinking water containing copepods (water fleas) that are infected with Dracunculiasis medinensis larvae. One year after human ingestion of infected water a female adult worm emerges, typically from a lower extremity, producing painful ulcers that can impair mobility for up to several weeks. This disease occurs annually when agricultural activities are at their peak. 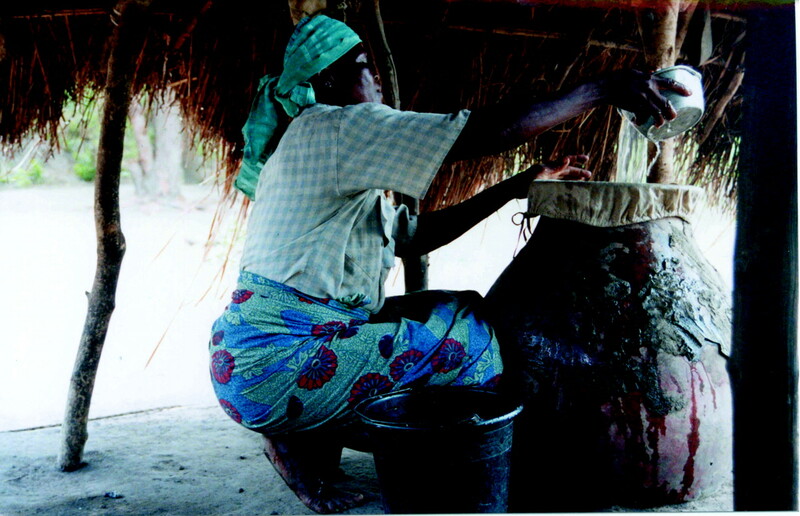 Large proportions of economically productive individuals of a village are usually affected simultaneously, resulting in decreased agricultural productivity and economic hardship. Eradication of guinea worm disease depends on prevention, as there is no effective treatment or vaccine. Since 1986, there has been a 98% reduction in guinea worm disease worldwide, achieved primarily through community-based programs. These programs have educated local populations on how to filter drinking water to remove the parasite and how to prevent those with ulcers from infecting drinking-water sources. Complete eradication will require sustained high-level political, financial and community support. Dracunculiasis (guinea worm disease), caused by the nematode parasite Dracunculiasis medinensis, is a painful, disabling disease of impoverished, rural villagers in 13 sub-Saharan African countries that do not have access to safe drinking water. The disease has a low mortality rate but causes an enormous amount of morbidity and is often economically devastating for affected villages.1,2,3,4,5,6,7 The Global Dracunculiasis Eradication Campaign, which began in 1981, has reduced the number of afflicted people by 98%. In 1986 there were 3.5 million cases in 20 different countries in Asia and Africa. In 2002 fewer than 55 000 cases were reported, from 13 African countries. The greatest burden of guinea worm disease today occurs in Sudan, Ghana and Nigeria. These 3 countries together account for 93% of all cases worldwide, with Sudan reporting 73% of the cases.8 The goal of the Global Dracunculiasis Eradication Campaign is to stop transmission of guinea worm disease outside of Sudan by the end of 2004, and within 4–6 years after peace and stability have been achieved in the disease-endemic areas of Sudan. The nematode D. medinensis belongs to the order of Spirurida, which are tissue parasites that produce eggs containing larvae or release free larvae and that require arthropods as intermediate hosts. The best-known examples of this order are the filariae, which include the important human parasites Wuchereria bancrofti and Brugia malayi (causes of elephantiasis), Onchocerca volvulus (cause of river blindness) and Loa loa (the eye worm). The mature female guinea worm is one of the longest nematodes, measuring up to 1 m in length, but is only 1–2 mm thick. There is no known animal reservoir of infection (even though this has not been conclusively disproved), which makes eradication much more probable if safe drinking water can be ensured. Infected people remain assymptomatic for about 1 year after infection, at which time the mature female worm approaches the skin and forms a papule in the dermis (Fig. 2) that is painful because of the host reaction. The initial blister is accompanied by redness and induration and is preceded by a slight fever, an urticarial rash with intense pruritus, and systemic symptoms of nausea, vomiting, diarrhea and dizziness. Over the course of up to several days the blister enlarges and ruptures to expose the adult worm (Fig. 3). The pain and systemic symptoms decrease with the rupture of the blister, and the worm usually is manually extruded by winding it onto a stick over several weeks. As the guinea worm emerges through the dermal lesion, the affected person pulls it out slowly and carefully (to minimize inflammation and pain) by winding a few centimetres of the worm each day onto a stick. This painful process may take several weeks, as the worm may be up to 1 m long. The pain can be relieved with wet compresses on the lesion and the use of an oral analgesic. 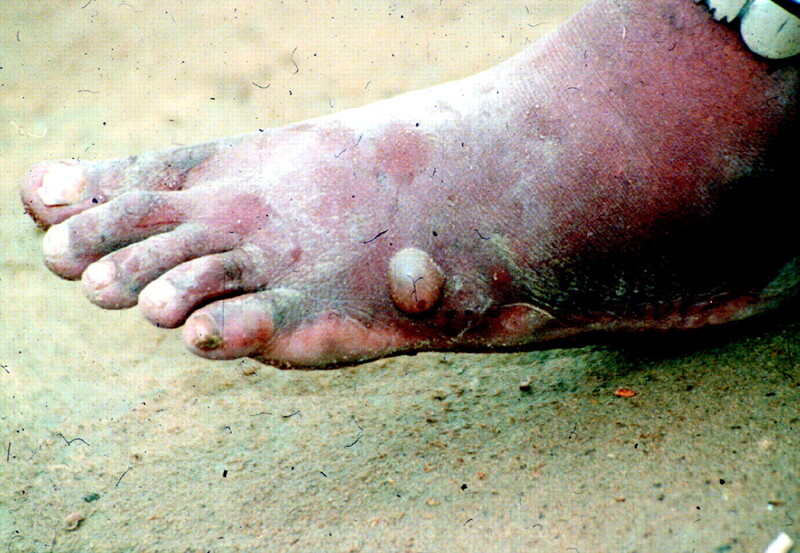 The risk of bacterial superinfection can be reduced with the use of topical antiseptics or antibiotic ointment.16 In one study the mean duration of disability from guinea worm disease was 50% shorter among patients who had been given antibiotics as well as instructions and supplies to clean and dress their wounds than among those who did not receive any intervention.3 No anthelminthic medication is effective against the disease, and there is no vaccine.2,17 Chippaux18 found that treatment with mebendazole was associated with aberrant migration of worms, which were more likely than usual to emerge in places other than the lower limbs. Prevention is the only effective intervention to reduce the incidence of guinea worm disease. The United Nations declared 1981–1990 to be the International Drinking Water Supply and Sanitation Decade (IDWSSD), raising the possibility that guinea worm disease could be eradicated by improving the quality of human drinking water. In 1981 the US Centers for Disease Control and Prevention (CDC) proposed that guinea worm disease would be the ideal indicator with which to measure the success of this global initiative. By the mid-1980s, however, it was evident that it would not be possible to gather all of the resources needed to achieve the intended goals of the IDWSSD. As a result, in 1986 The Carter Center led a movement, in collaboration with the CDC, UNICEF and the WHO, to increase advocacy and funding for the Global Dracunculiasis Eradication Campaign. High-level advocacy has been an important aspect of the campaign, with sustained support by former US president Jimmy Carter and 2 former African heads of state, Amadou Toumani Touré of Mali and General Yakubu Gowon of Nigeria.2,21,22,23 As the campaign gained momentum, transmission of guinea worm disease decreased in several countries, and in 1991 the World Health Assembly passed a resolution calling for the eradication of guinea worm disease by 1995. Since the beginning of the Global Dracunculiasis Eradication Campaign, 7 countries have eradicated the disease, including Pakistan (1993), Kenya (1994), India (1996), Cameroon, Senegal and Yemen (1997) and Chad (1998)23,24 (Fig. 4). Because of the campaign, the number of reported cases decreased from 3.5 million cases in 20 countries in Asia and Africa in 1986, to fewer than 55 000 cases in 13 African countries in 2002 (Sudan, 41 493; Ghana, 5606; Nigeria, 3820; Togo, 1479; Mali, 857; Burkino Faso, 580; Côte d'Ivoire, 266; Niger, 233; Benin, 157; Mauritania, 42; Ethiopia, 24; and Uganda, 6 [number not reported for Central African Republic]). The successful implementation of these strategies has led Global Dracunculiasis Eradication Campaign to target the eradication of guinea worm disease in all countries except Sudan by the end of 2004. Sudan has the greatest burden of disease in the world, primarily because a 20-year-long civil war has made it difficult to implement an effective eradication program. A program was first established in Sudan in 1995 when former president Jimmy Carter negotiated a successful 4-month “guinea worm cease fire.” All fighting ceased during this period, allowing health care workers to educate villagers about guinea worm disease and to disseminate cloth filters in some of the remotest areas of the country.21,26,27 This did not have a lasting effect, however, as the civil war currently prevents access to affected villages, particularly in the southern part of the country. It is estimated that at least 5 years will be required to eradicate guinea worm disease in Sudan once an effective program is established.21 Continued success of the Global Dracunculiasis Eradication Campaign will depend on adequate funding, the ongoing cooperation of affected villagers, continued political support and political stability in affected countries. The Global Dracunculiasis Eradication Campaign has been enormously successful over the past 20 years, reflected in a decrease of the global burden of the disease by 98%. This has been achieved through high-level political advocacy, sustained financial support and community-based health interventions implemented by villagers. The challenge to complete the eradication of guinea worm disease worldwide remains in the resolution of the long-standing civil war in Sudan followed by the institution of effective prevention programs in that country. Acknowledgements: The photographs and map as well as the latest data about the Global Dracunculiasis Eradication Campaign were provided by The Carter Center and Emily Howard. Insights and details about the eradication campaign were obtained through discussions with Dr. Ernesto Ruiz-Tiben, Technical Director, Dracunculiasis Eradication, The Carter Center, drawn from his more than 20-year involvement with the campaign. Dr. Ruiz-Tiben also reviewed the manuscript. Smith GS, Blum D, Huttley SRA, Okeke N, Kirkwood BR, Feachem RG. Disability from dracunculiasis: effect on mobility. Ann Trop Med Parasitol 1989;83(2):151-8. Cairncross S, Muller R, Zagaria N. Dracunculiasis (guinea worm disease) and the eradication initiative. Clin Microbiol Rev 2002;15(2):223-46. Belcher DW, Wurapa FK, Ward WB, Lourie IM. Guinea worm in southern Ghana: its epidemiology and impact on agricultural productivity. Am J Trop Med Hyg 1975;24(2):243-9. Watts SJ, Brieger WR, Yacoob M. Guinea worm: an in-depth study of what happens to mothers, families and communities. Soc Sci Med 1989;29(9):1043-9. Chippaux JP, Banzou A, Agbede K. Impact social et économique de la dracunculose : une étude longitudinale effectuée dans deux villages du Bénin. Bull World Health Organ 1992;70(1):73-8. Ilegbodu VA, Kale OO, Wise RA, Christensen BL, Steele JH, Chambers LA. Impact of guinea worm disease on children in Nigeria. Am J Trop Med Hyg 1986;35(5):962-4. Nwosu ABC, Ifezulike EO, Anaya AO. Endemic dracontiasis in Anambra State of Nigeria: geographical distribution, clinical features, epidemiology and socio-economic impact of the disease. Ann Trop Med Parasitol 1980;76:187-200. Department of Health and Human Services. Detect every case, contain every worm! 8th meeting of national coordinators held in Kampala [Guinea worm wrap-up no 132]. Atlanta: US Centers for Disease Control and Prevention; 2003 Apr 25. Available: www.cdc.gov/ncidod/dpd/parasites/guineaworm/wrapup/word132.pdf (accessed 2004 Jan 12). McMahon JE, Simonsen PE. Filariases. In: Cook G, editor. Manson's tropical diseases. London: W.B. Saunders Co; 1996. p. 1358-62. Kale OO. The clinico-epidemiological profile of Guinea worm in the Ibadan District of Nigeria. Am J Trop Med Hyg 1977;26(2):208-14. Ilegbodu VA, Ilegbodu AE, Wise RA, Christensen BL, Kale OO. Clinical manifestations, disability and use of folk medicine in dracunculus infection in Nigeria. J Trop Med Hyg 1991;94(1):35-41. Edungbola LD. Babana Parasitic Diseases Project. II. Prevalence and impact of dracontiasis in Babana District, Kwara State, Nigeria. Trans R Soc Trop Med Hyg 1983;77(3):310-5. 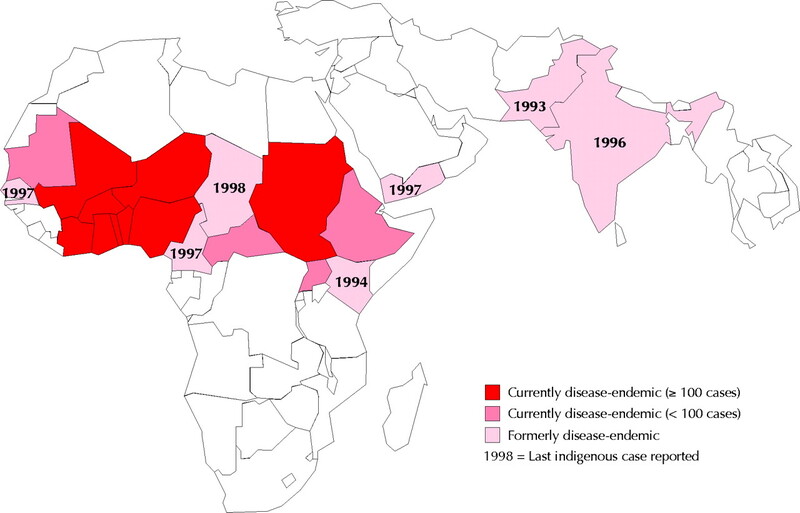 Imported dracunculiasis — United States, 1995 and 1997. MMWR Morb Mortal Wkly Rep 1998;47(11):209-11. Ruiz-Tiben E, Gutierrez Y. Dracunculiasis. In: Guerrant RL WD, Weller PF, editors. Tropical infectious diseases. Principles, pathogens and practice. Vol 2. Philadelphia: Churchill Livingstone; 1999. p. 903-6. 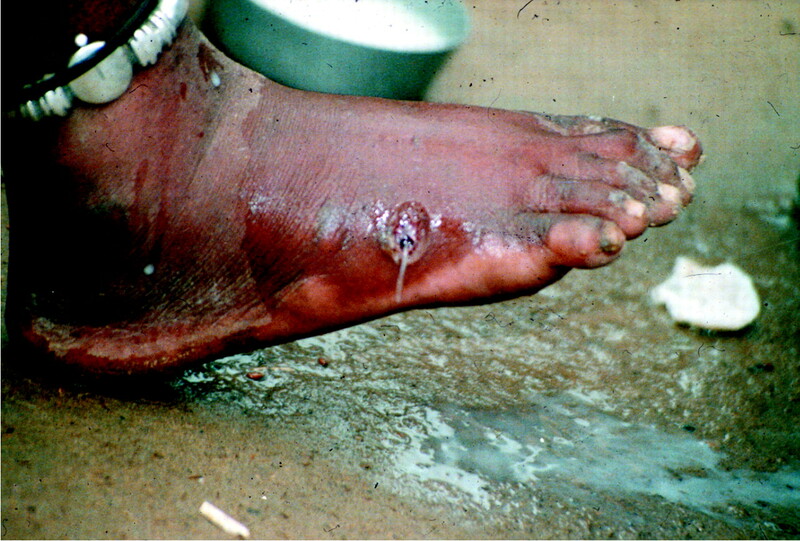 Hours M, Cairncross C. Long-term disability due to guinea worm disease. Trans R Soc Trop Med Hyg 1994;88(5):559-60. Magnussen P, Yakubu A, Bloch P. The effect of antibiotic and hydrocortisone-containing ointments in preventing secondary infection in guinea worm disease. Am J Trop Med Hyg 1994;51(6):797-9. Issaka-Tinorgah A, Magnussen P, Bloch P, Yakubu A. Lack of effect of ivermectin on prepatent guinea-worm: a single-blind, placebo-controlled trial. Trans R Soc Trop Med Hyg 1994;88(3):346-8. Chippaux JP. Mebendazole treatment of dracunculiasis. Trans R Soc Trop Med Hyg 1991;85(2):280. Hopkins DR. The guinea worm eradication effort: lessons for the future. Emerg Infect Dis 1998;4(3):414-5. Aylward B, Hennessey KA, Zagaria N, Olive JM, Cochi S. When is a disease eradicable? 100 years of lessons learned. Am J Public Health 2000;90(10):1515-20. Progress toward global dracunculiasis eradication, June 2002. MMWR Morb Mortal Wkly Rep 2002;51(36):810-1. Brieger WR, Otusanya S, Adeniyi JD, Tijani J, Banjoko M. Eradicating guinea worm without wells: unrealized hopes of the Water Decade. Health Policy Plan 1997;12(4):354-62. Hopkins DR, Ruiz-Tiben E, Ruebush TK, Diallo N, Agle A, Withers PC. Dracunculiasis eradication: delayed, not denied. Am J Trop Med Hyg 2000;62(2):163-8. Dracunculiasis. Global surveillance summary, 2000. Wkly Epidemiol Rec 2001; 76(18):133-9. Hopkins DR, Ruiz-Tiben E. Strategies for dracunculiasis eradication. Bull World Health Organ 1991;69(5):533-40. Hopkins DR, Ruiz-Tiben E, Diallo N, Withers PC, Macquire JH. Dracunculiasis eradication: and now, Sudan. Am J Trop Med Hyg 2002;67(2):415-22. Implementation of health initiatives during a cease-fire — Sudan, 1995 [published erratum in MMWR Morb Mortal Wkly Rep 1995;44(25):479]. MMWR Morb Mortal Wkly Rep 1995;44(23):433-6.